its4land is an EU-financed project to assist Kenya, Rwanda and Ethiopia in mapping land tenure more quickly, cheaply and transparently. It will end in three years’ time; right now, the Africans and Europeans are in the phase of needs assessment. The focus is not on technical requirements, but on operational priorities and managerial context. The first results indicate that low-cost geospatial technologies will be helpful, not least because they also benefit priorities other than improving cadastral services. The its4land project aims to adapt and validate a land-tenure recording suite based on small, fixed-wing unmanned aerial vehicles (UAVs or ‘drones’), smart sketch maps, automated feature extraction and geocloud services. These tools have been applied in general mapping elsewhere. In this project they will, for the first time, be adapted for land administration use for the benefit of Kenya, Rwanda and Ethiopia. The aim is to help map land rights more quickly, cheaply and transparently for all stakeholders – women explicitly included. The first project phase is an assessment of the technical and non-technical user needs, as broadly as is relevant to meet sustainable development imperatives. Dr Serene Ho, working at the Public Governance Institute at KU Leuven in Belgium, is tasked with getting a good picture of those needs, connected norms and values and so on. Dr Ho explains the importance of this phase: “All three East African countries have different existing land reform projects, but success can be limited by a gap between formal processes and acceptance in communities. Land information is an engineering-dominated, technology-driven field. Most people think technology adoption is determined by rational drivers like cost-benefit analysis, but it is not the most efficient technology that will be adopted; it is the one that meets needs while also fitting with contemporary values. This kind of assessment will also likely lead to better outcomes for the latter parts of the project associated with governance and business models.” The European Union is funding this project to the tune of EUR3.9 million. The its4land project is led by the University of Twente (The Netherlands). The academic partners are Münster University (Germany), Technical University of Kenya, Bahir Dar University (Ethiopia) and INES Ruhengeri (Rwanda), and the companies Esri Rwanda and Hansa Luftbild are also participating. Products or services will be developed based on open-source technologies. Worldwide, it is estimated that only 50 countries have complete and up-to-date national land registries in which each property has a verifiable owner and mapped boundary, and there is room for improvement in the tenure-recording systems in the three co-located East African countries too. In Ethiopia, the population mostly consists of rural dwellers (80 million people out of 100 million); only 25% of them have some form of land record and far less of the country is spatially mapped. A map of land tenures in rural areas could also support impending land consolidations as land fragmentation begins to undermine food security efforts. In Kenya (48 million people) cultural differences in land rights are a key source of conflict. Almost 10 million Maasai (and Samburu) pastoralists do not have means for demonstrating legitimate land uses and holdings. Cities are growing at a fast rate and that is disrupting all kinds of patterns: women cannot go to wells, and long-standing livestock herding routes are now blocked by privately held land preventing access to water and pasture. It is a growing source of conflict: in the face of worsening drought, pastoralists who have a communal approach to land use and access send their herds onto farmers’ privately owned grassland. And, last but not least, Rwanda (population of about 13 million) managed to recently map and record its 13 million land parcels, but several million records – mostly from holders of tiny farms – remain untitled. Moreover, it must be ensured that all updates relating to land transactions can easily be recorded in official systems. Politics and policies are the givens. “Our aim is to understand each country’s current land tenure information needs, to identify which technologies will be most appropriate; we are matchmakers,” states Dr Ho. For example, Kenya’s customary tenure has been challenging to administer. The Maasai can define their boundaries using geographic features. They may say: ‘Our land stretches to that mountain, then to the right until you get to that river’. The project is exploring how smart sketch maps might make a difference. “In its4land we are aiming to record such descriptions of large areas of land use through sketching. These will be processed so that they can be aligned with metric maps. This adds a socially constructed dimension of land tenure that is currently difficult for formal land administration systems to accommodate.” While sketching is usually carried out on plain paper, it could also be done on top of a UAV image. At the same time, the project seeks to identify differences between women and men in their approach to sketching and in the data they produce. UAVs will certainly be of use in Kenya from other perspectives. The High Court recently overturned all land transactions since 2013 because it found that poor land information had led to a spate of erroneous or fraudulent titling. Many plots have an overlap; on large plots, it can be as much as 1 kilometre. Now the Kenyans have high hopes for the use of drones with the registration of land transactions. 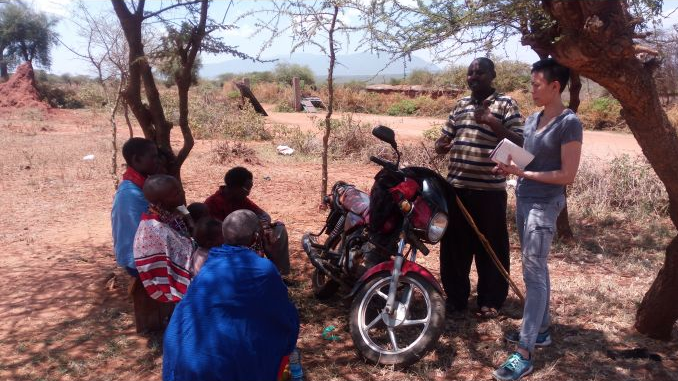 For instance in Kajiado county, one of the case locations for the project, the plots often comprise a few thousand acres and UAV-collected data could very well facilitate the survey process. UAVs are quick to deploy, the sensors have very high accuracy and a broad-wing UAV can fly for up to two hours. Phase one – ‘Get needs’ – of the its4land project will conclude by June 2017. Government agencies at different levels, NGOs, academia and the private sector are engaged through workshops. Local communities tend to be interviewed separately. The emphasis of these activities is to arrive at a consensus around identification and prioritisation of the needs, as well as stakeholders’ perceptions of the potential application of UAVs, smart sketch maps, automated feature extraction and geocloud services for those needs. At the time of writing, data collection has been completed in Rwanda and is in the final stages in Kenya. In Ethiopia, a national conflict has limited the research activities. The second tool nominated in Rwanda concerned the geocloud services, given the identified needs around data harmonisation and data sharing. Smart sketch maps, possibly in combination with UAV images and automated feature extraction, could also play a role, particularly in facilitating community participation in planning. However, stakeholders also recognised barriers to adoption of the innovative geospatial tools that exist at individual, organisational and structural levels: specialised skills, outdated and/or non-digital information, the fact that there is currently only one registered UAV pilot in Rwanda, and availability of electricity and connectivity.